The Audra Table Clock by Howard Miller is a Brushed and polished-brass finished metal carriage alarm clock with polished-brass finished decorative handle, turned button feet, and columns. Howard Miller offers a warranty which is our promise and commitment that our products have been manufactured using the finest materials and have been thoroughly inspected prior to being shipped from our facilities. Our warranty is available exclusively through authorized retailers only. Please inquire with any 3rd party seller prior to purchase to confirm warranty eligibility. Purchases made from unauthorized retailers will not be eligible for warranty services through Howard Miller or its authorized service center network. A brushed and polished brass finish gives this metal carriage alarm clock its enduring style. 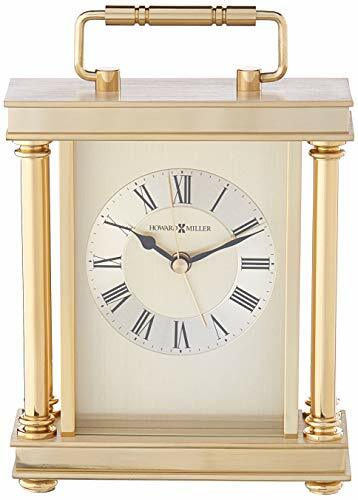 The decorative handle, turned brass-tone button feet, and polished brass-tone columns at the corners add to the clock's stately presence. Beneath a glass crystal, the brushed brass-tone dial features circular, diamond-cut numeral ring, black Roman numerals, black hour and minute hands, and brass second and alarm hands. If you have any questions about this product by Howard Miller, contact us by completing and submitting the form below. If you are looking for a specif part number, please include it with your message.